After a beautiful Sunday our forecast looks to change again. 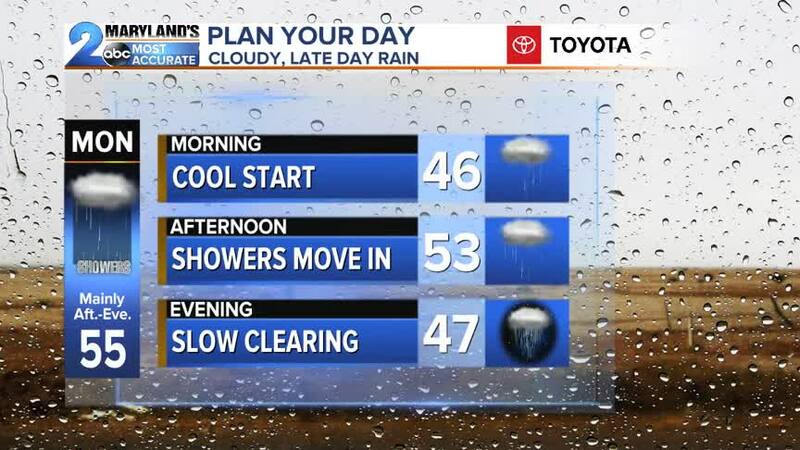 Cooler temperatures and rain are coming back to the forecast for the start of the new workweek ahead. Rain showers look to arrive Monday afternoon as an area of low pressure from the Midwest undercuts us to the south. The low pressure system will stay south of our area with a cold frontal boundary following on the back end. Rain amounts will not be all that impressive with this storm system only amounting to 0.25"-0.50". Colder air will be the bigger story behind the front as it comes through. Highs will be in the 50s Monday with overnight lows around freezing. Even colder air is expected Tuesday as the sunshine returns with high temperatures barely making 50 degrees. Tuesday night poses us with the chance of a frost or hard freeze before temperatures warm midweek. High pressure parks overhead Wednesday before sliding east Thursday giving us warm return flow. Highs Wednesday will be in the 50s before climbing to near 60 Thursday and possibly 70 degrees Friday. Even warmer air is expected into the weekend ahead. Long range 8-14 day trends continue to suggest above average temperatures and above average precipitation across the region. So far since the start of the year we have seen nearly 11" of rain which is almost 2" above the average. This could be a sign of things come for the Spring Flood Risk ahead. Waterlogged in 2018 with the 2019 season so far not looking any different.